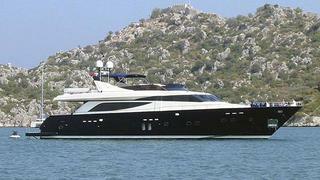 Thierry Voisin sends news of a further €150,000 price reduction on his central listing, the 28.1m motor yacht Red Sky. Built by Couach Yachts in 2002, she accommodates nine guests in four cabins. Professionally maintained by a full-time captain, Red Sky is commercially registered and her twin 1500hp MTU engines give her a cruising speed of 21 knots. Her berth in Menton is also for sale either as part of a package or by separate arrangement and Red Sky is now asking €1.65 million.